A film screening of Pamela Yates's documentary 500 Years. Presented in partnership with the USC School of Cinematic Arts. Co-sponsored by the USC Gould Law School's Center for Law, History and Culture. Pamela Yates presents her documentary film, 500 Years, the third and final installment in Yates and Skylight’s epic trilogy on Mayan indigenous resistance in Guatemala, The Resistance Saga, which began with When the Mountains Tremble (1983) and was followed by Granito: How to Nail a Dictator (2011). This new film tells the sweeping story that led Guatemala to a tipping point in its history, from the genocide trial of former dictator General Ríos Montt to the popular movement that toppled sitting President Otto Pérez Molina. 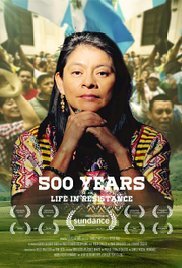 Focusing on universal themes of justice, racism, power and corruption, 500 Years tells the story from the perspective of the majority indigenous Mayan population in Guatemala, and explores their struggles in the country’s growing fight against impunity. The screening will be followed by a Q&A session with director Pamela Yates.